Space per pupil: 61 sq.ft. The research, visioning, programming, and conceptual design process occurred over a four month period during the summer of 2011. Starting with a previous master plan, the college formed a steering committee to lead the overall project vision. Meanwhile the design team met with the leaders and faculty of all departments to assess their current space, usage of that space, and determine future space needs. Programming research was continually shared with the college administration and steering committee to ensure complete buy-off from the college. This planning analysis combined with the project goals provided a program for the team to design around. The college and design team made research visits to various community colleges in the region as well as the University of Virginia and Virginia Tech to aide in verifying the direction the college wanted to proceed with their academic programs and technology. 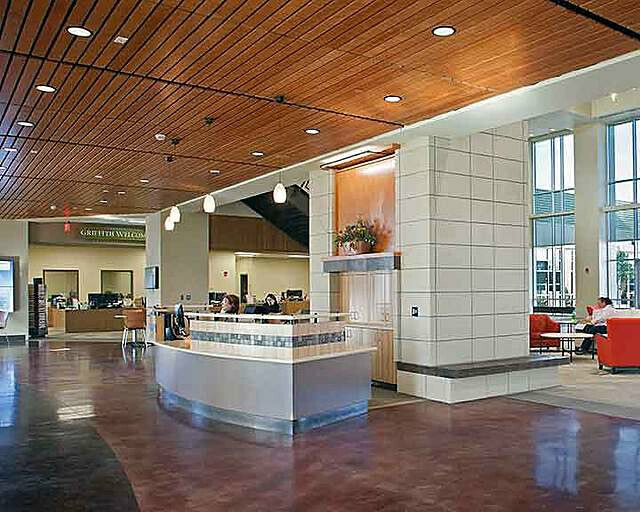 After the programming and research phase the college and design team selected potential site locations on campus and vetted each site for its effect on campus through environmental factors, way finding, traffic, campus academic adjacencies, academic adjacencies within the existing building, and project cost implications. 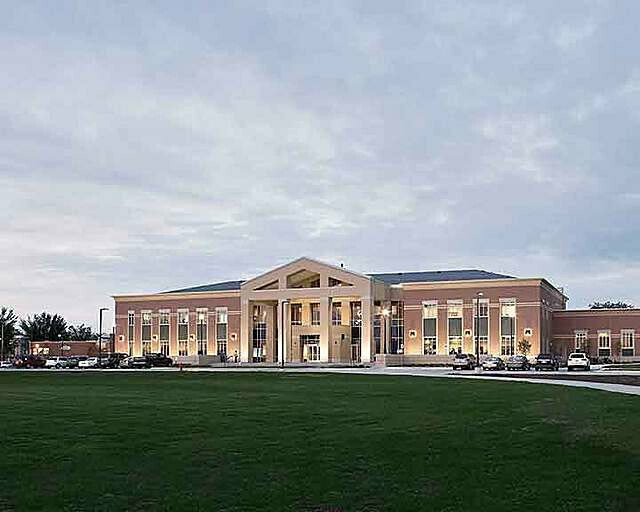 When the expansion and renovation sites were located, the building design proceeded with a continuous cyclical process of design and review between the design team, the steering committee, faculty, the State of Wyoming, and college administration. Sheridan College is committed to the future growth of Sheridan Wyoming. The college was founded in 1948 and the campus was built during the double loaded corridor machine age of the 1950’s and 60’s. Combined with the fact that the campus hosted a lack of community friendly space, odd one way roads, confusing pedestrian paths, and a hidden front door, it was clear the college was not connecting with the community in the best light. A. Provide a new front door to the college. B. Provide a welcoming one-stop-shop for student services. C. Further incorporate STEM into the college. D. Enhance student faculty interaction. E. Improve campus way finding. F. Bring cutting edge teaching technology to the campus. G. Create a central gathering space for the college. H. Establish a building aesthetic that connects the stability of the college to the significant historical architecture of downtown Sheridan. 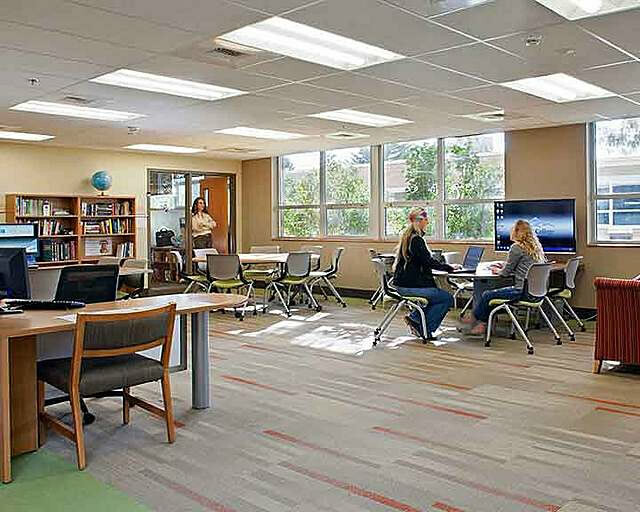 The EAWAC project renovates 18,000 square feet of claustrophobic double loaded corridor classroom space, adds 35,000 square feet of new classroom and student service space, while enabling the redesign of campus vehicle and pedestrian traffic. Provide a new front door to the college. The building hosts many new student functions and acts as the first point of contact for campus visitors, thus we decided to keep the building on the west side of campus and have it face out towards Coffeen Avenue, one of Sheridan’s main arterials. We then reconfigured the main drive loop around campus enabling the installation of a landscaped welcome sign and two way traffic in front of the building. The building design concept developed around using a three sided courtyard defined by the existing building, turning it into a full-fledged courtyard by connecting the two wings that surrounded it, and then centering the open entry and gathering spaces on axis with the courtyard and the west campus lawn allowing stimulating nature based focal points in both directions. Provide a welcoming one-stop-shop for student services. The college completely renovated and streamlined their admissions and advising process into a singular one-stop-shop experience for students. Adjacent to the main entry and gathering space, student service specialists handle questions and direct students. 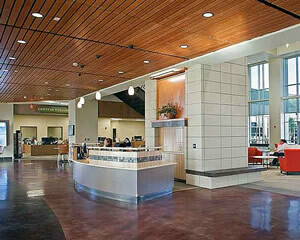 The space is oriented as a loop to align with the student experience of advising, registering, and paying for classes. Further incorporate STEM into the college. We worked closely with the College to develop a slate of STEM classrooms that would maximize flexibility for progressive teaching methods. The renovation and expansion hosts a diversity of classrooms including; learning labs, dividable classrooms, a double tiered classroom, harkness classroom, computer based classrooms, GIS CAD Lab, physics lab, analytics lab, and writing and math centers. The campus population growth, combined with a growing volume of collaborative team-based coursework, meant that students were significantly lacking both formal and informal space to meet on campus to discuss, and work together. 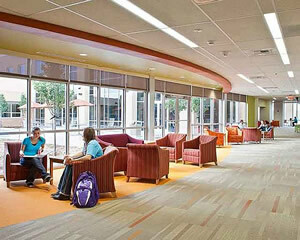 Numerous styles and types of student faculty interaction spaces were included in the expansion and remodel. Warm comfortable niche spaces (and a coffee shop!) were created to encourage commuter students to remain on campus between classes. Larger comfortable spaces were created in prominent locations to encourage teamwork to occur on campus near faculty. And finally, friendly, technologically advanced spaces were created immediately adjacent to faculty offices to encourage students to work next to their professors. The reconfiguring of the main drive around campus removed the awkward one-way road and hidden main building entry. This allowed the new expansion and two-way road to be built in its place enabling a clear and welcoming experience for visitors and new students. Create a central gathering space for the college. Having members of the community attend events and programs on campus is an important goal for the college. 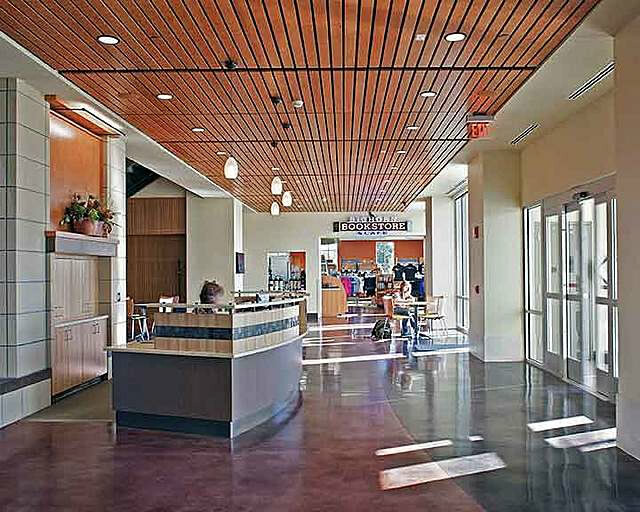 While primarily used as student lounge space, the gathering space can function as a large event space for formal dinners or speaking events to attract the community to the campus. The mezzanine features a full allosaurus skeleton to attract local grade school field trips to the college. Bring cutting edge teaching technology to the campus. We incorporated two standout programming concepts into the project in terms of technology and its implementation, the Learning Lab and the Center for Teaching and Learning.The Learning Lab is a technology rich space that moves the instructor out from the “sage on a stage” position into a facilitator role in the middle of the room. Students are grouped at collaborative tables with easy view of at least one of several screens. The room switches from lecture to discussion to project to student presentation modes without needing to move anything. Thus the class can use any and all modes in any given period of the day. The Center for Teaching and Learning provides the faculty with resources, instruction and technical support for incorporating technology in their lessons. An adjacent Learning Lab allows the CTL staff to provide support for this very new style of classroom. Also included is a small recording studio for faculty to create recorded lectures for “flipping the classroom” (i.e. lectures are viewed before class and homework problems are worked together in class). Establish a campus building aesthetic that connects the stability of the college to the significant historical architecture of downtown Sheridan. 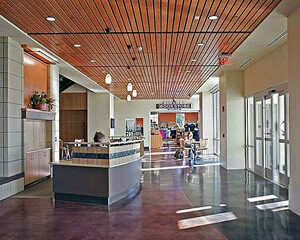 Prior to recent work, the Sheridan campus architecture was sterile and disjointed. The community viewed the campus as a two year commuter college ticket out of town. An emphasis has been placed on the livability of the campus to attract students to Sheridan and become potential residents. 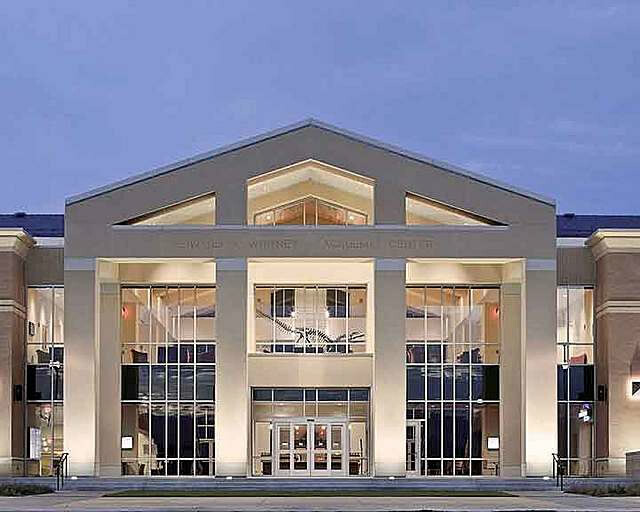 The architecture of the new expansion was designed to convey the permanence and commitment of the college to the community. 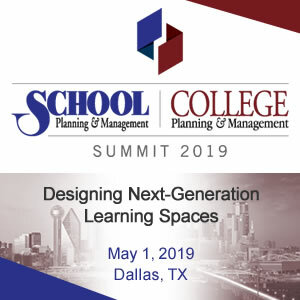 While designing the building, design guidelines were put into place to outline a collective campus aesthetic of warmth, tradition, and learning for all future buildings on campus. 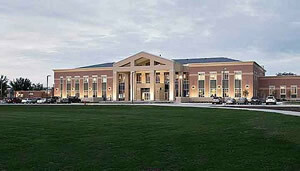 The college and design team settled upon guidelines for new construction on campus, most notably that new buildings should present a form that reflects the visual goal of being “Collegiate.” Wne defined this as a form that consists of; occasions of symmetry, formality in rhythm, vertically oriented windows, and multi-story building massing. We then collaborated with the University of Wyoming geology department to help us select materials that would be region specific and timeless.